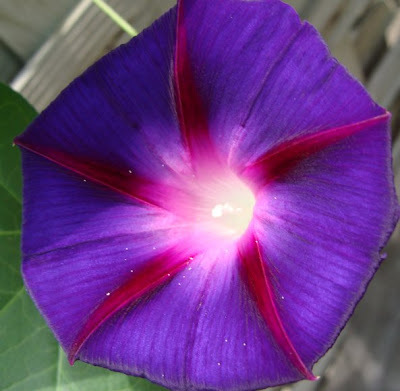 I grew Morning Glory (Ipomoea purpurea 'Star of Yelta') and Black-eyed Susan (Thunbergia alata 'Blushing Susie') from seed this year with the aim of covering the trellis at the side of the house. 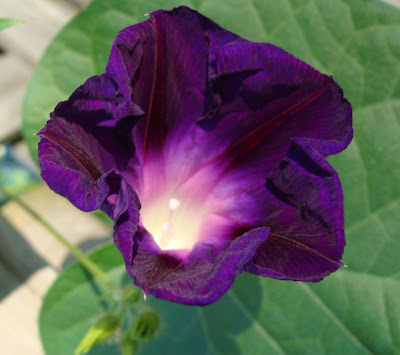 The Morning Glory has just started to bloom. In the morning the flowers unfold like a new butterfly's wings. The 'star' is very obvious once the flower fully opens. In the evening the blooms fade, but they look lovely with the sunlight behind them. That deep purple really does look like crushed velvet! Wonderful blooms. Just lovely! I am crazy about purple so this one is beautiful. Oooh, I am jealous! It is indeed beautiful. 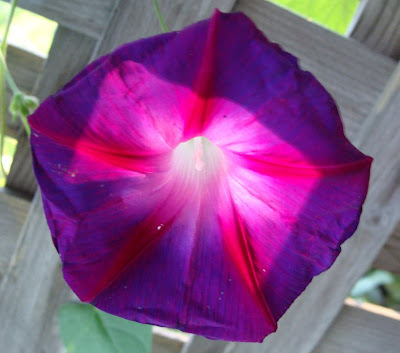 My morning glories haven't been up to par this year.